Along the Avisio stream, Soraga emerges – one of the seven towns of Val Di Fassa. Historically considered the first true town of the valley, it is one of the most popular destinations for holidays without stress and far from chaos, surrounded by the Dolomites. Departing from Pezzè lake, strolling through Soraga is a pleasure and a continuous discovery. Walking along the streets, you can see houses made from ‘tobià’, old barns, typical Fassano dwellings. Visit the church of Santi Pietro e Paolo, built in the 1500s. Proceed towards the games park where the children can run and have fun in a green environment. While they play and enjoy themselves, you can read a book in the cool shade of the trees. If you prefer a more active holiday, rent a bike in the town and follow the cycle path. You can easily reach Alta Val di Fassa, until Alba di Canazei, or complete the route to Val di Femme until Molina di Fiemme. Thanks to its ideal position between two valleys, Soraga is the perfect choice for forgetting the car and moving around exclusively with the public transport available. Discover the Ladin traditions and the history of Val di Fassa at the Ladin Museum in Vigo di Fassa. For a few hours you will feel as though you have been taken back in time, as you become immersed in life as it once was in Val di Fassa and discover its secrets. Reaching Soraga is easy, whatever your mode of transport. Coaches reach Val di Fassa from the main airports of north-east Italy, and we are also connected with the Flix Bus low-cost transport lines. Do you prefer travelling by train? No problem. From Bolzano and Trentino, buses depart frequently to arrive in Val di Fassa. For a tranquil holiday, chose Soraga and Val di Fassa, where you can enjoy the Dolomites, a UNESCO World Heritage Site, and the warm Ladin hospitality that characterises the area. 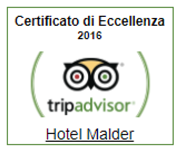 Contact us and we will provide all the information required to make your holiday at Hotel Malder an unforgettable experience in one of the most beautiful places in the world.